The European Union considers combating climate change a priority. According to the Roadmap for moving to a competitive low carbon economy in 2050, “Europe is working hard to cut its greenhouse gas emissions substantially while encouraging other nations and regions to do likewise.” In this regard, the EU Emissions Trading Scheme (EU ETS) established by Directive 2003/87/EC, (the “EU ETS Directive”) represents the fundamental base of the EU's strategy for fighting climate change. 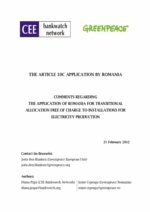 Directive 2009/29/EC amending the EU ETS Directive brought substantial changes to the EU ETS, introducing a harmonised EU-wide approach to the allocation of greenhouse gas emission allowances to installations covered by the system.